New JackFrag's video makes me want to crawl up into a ball and cry. bottom line is they just aren't delivering a great experience any more. There are too many bugs, too many annoying design decisions, too many half-finished questionable features, too many longer term problems never addressed all the while delivering less content. It all adds up to an annoying experience where one just is so turned off that they just abandon the franchise. If they need to switch engines to something more reliable and malleable in order to turn the ship around then do it even if it means losing destruction. If they have to contract the franchise out to Nintendo in order to get it polished and formed into a fun game at 60fps then do it. They have a template and all the ideas they need for the next great battlefield game. It’s called Battlefield 2. It’s their property, its all there, but they REFUSE to make a real BF game like BF2 because.... edgelords? I don’t know, they’re sitting on a gold mine while claiming to be broke. What he's saying in a nutshell (Jack), is that it would take six years as a game service to get all the factions and maps folks already thought they'd be getting in a two year cycle.. What he probably found out, given his tone, is that it's likely they're already focusing on the next game, where we're lucky to get one more faction, or, they want to milk this disaster for six more years, for which DICE would have to be totally out of their mind. As others are saying better than i, just dismiss Jack and his failed you tube bretheren, and their views, and read between the lines. He cheerled this failure, is not getting the views he used to get, and he has to own up too it. To be clearer, im saying DICE/EA are the edge lords, not the Tubers. Well, i wouldn’t be surprised but ive never watched any tuber so I don’t know them. Assignments and medals tracked all at the same time. This part is incorrect, there were problems with assignments and medals and unlocks in previous titles, and threads about that in the official forum (same place we are today). Assignments didn't have to be activated (a bizarre addition to the process which I don't understand) but there was no guarantee they would work even if in theory they were all tracked at once--sometimes they didn't track at all. I share your disgust with how DICE has either managed to do away with many things which used to work, but pretending that everything worked well in previous titles just isn't true, and that applies to assignments. I can remember the angry threads about players not getting their unlock or whatever, so this is nothing new. I did happen, but it surely did not happen to an extent that we have in BF5 where people literally could not unlock ToW assignments for weeks, not to mention one of the stupidest things in BF5 - Armory. Why do I even have to unlock a thing or be given one for free (Ribeyrolles and M1897 shotgun) only to have them put into armory instead of my inventory, its confusing af. So many people (Myself included) had issues where we would unlock something only to find out that its nowhere to be found. I never had this issue in BF3 or BF4 because it wasn't as common there. Hell even BF1 did a better job at giving you the reward you've earned. As for activating assignments, its simple - Artificial progression. Dice deliberately prolonging our progression because the progression that we have now is very basic and minimal. If I weren't so lazy to change my assignments, I would already have golden skins for most of the guns in the game. But since I'm too lazy to leave the game and change them, I have about a billion of unfinished assignments in my inventory. That's what baffles me, things which worked fine are gone and in their place are things which not only don't work well but are often highly annoying instead. I understand their desire to give a new game a different look, try some new things--but those new approaches need to work at least as well as the old ones, not worse! To have to leave the server to activate a new assignment and then sit in queue to rejoin my friends does not cause me to think kind thoughts about whoever it was at DICE who designed this pointlessly annoying feature. As for how long it takes DICE to fix these things, I believe there are two causes: 1) the current DICE devs are not the Frostbite vets who designed earlier games and they have to move very slowly and carefully, 2) the money to pay for this work is in shorter supply thanks to the lack of paid DLC and Premium which brought a lot of funding to older titles. IIRC when BF4 launched EA had sold 1.6 million accounts with Premium (one of them was mine) and that amounts to eighty million dollars which helped to pay for the massive repair work that game needed. That source of revenue is missing in BFV, so unless they start selling skins and we all go nuts and heat up our credit cards buying them I don't think we should look for faster repairs or new content on a very impressive scale. Oh, after BF4 I swore to never pre-order again and I've stuck to that. I have zero problems with paid DLC or Premium, paid DLC resulted in bigger and better games and Premium saved me money over buying the DLC individually. Pre-ordering is another story, that just encourages the release of buggy, unfinished games. Most of these lackeys have been posting videos about their "roundtables" with Dice after flying there this past week. So they are getting face time with the decision makers while we get left in cold. Sounds great right? 1. What are you talking about doesn't exist???? We get WEEKLY updates from the developers on the forums and on Reddit. They address most concerns they feel need to be addressed. Just because there's not a constant dialogue and they're not responding to EVERY thread ever made doesn't mean there's no communication. Oh please these so called weekly Updates by the Developers are 99% just boring PR speech about things nobody is interested in. Exactly, the communication is superficial at best. At least when there were issues with other BF's, core features such as 3rd party rental servers and HC were still intact. Usually had a good amount of content at launch. Assignments shouldn't even be in the game. They just ruin the experience anyway. Assignments are just another example of a decision that makes the game less fun than before. It shows that no one is in charge of steering the ship. BFV is a failure of EPIC proportions - even worse than BFHL because frankly nobody had any expectations of that train wreck. WW2 buffs and a lot of BF fans had high hopes... only to be squashed by the MORONS at DICE who pulled a feat worse than SWBF!!!??? How do you run a franchise with almost a monopolistic hold on its genre into the ground???? Answer: Do what DICE did. Idiots. The answer to "how do you run a franchise with almost a monopolistic hold on its genre into the ground?" is "arrogance". DICE was so certain of the success of the game based on historic sales that they didn't even consider the possibility it could be a huge flop. I mean, you'd have to be arrogant to the point of delusion to tell your fan base to buy it or not, you don't care. Heres the original video. What do you think? You think he is telling the truth or saying what he was paid to say? You are being delusional. Tell me, do you also think the moon landings were faked? I've never seen such pathetic way to try and hide the fact that Dice totally screwed up with BF5. He made 3 points - Lets discuss all of them. 2nd Game engine holding back their game design and player usability It doesn't. We had a ton of things working properly in previous games running on the same engine and they worked fine. Assignments and medals tracked all at the same time. Symmetrical vehicle balance worked absolutely fine. Vehicle and weapon customization worked flawlessly for 4 games in a row, and now all of a sudden it doesn't work? Are you kidding me? What happened? Stars misaligned? Visibility was great in all games. 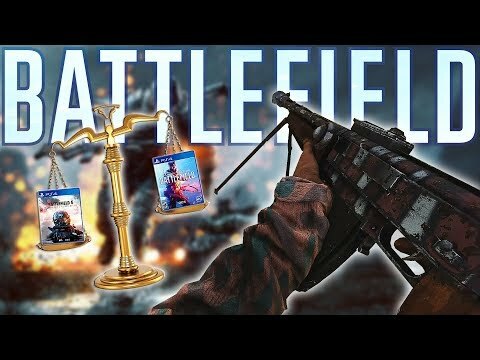 Even BF1 that is pretty much 90% graphically similar to BF5 got superior visibility. Class balance. You have BF1 where class balance was great. Every class had advantages and disadvantages. But NOOOOOO. You had to screw it all up by giving Assault most powerful weapons and those stupid MMGs for support that nobody asked for. So tell me please, which of those problems is held back by the engine? 3rd EA got a decision to make on what they want BF5 to be That decision is already made which is noticeable judging by the content we're getting. EA already decided to finish most post launch development. Dice is just finishing post launch content and will be spoon-feeding us that content little by little to cover up their failure. Mark my words as we're getting updated roadmap next week. ----> We will be getting a single faction along with 2 or max 3 maps in the next 5 or 6 months along with meaningless content such as additional cosmetics, lazy limited time game modes, badly balanced vehicles and weapons. Totally agree with you. JF and other paid EA youtubers are the same people that were making videos prelaunch and hyping this game up. I remember phrases as: This might be the best BF game ever made. When they finally realised people are not buying their or EA/Dice crap of a game they went silent and started posting less videos on BF. All of sudden 3-4 months after launch the biggest BF youtubers play BF once a week mostly. Dont trust a word of these gamechangers. C'mon now, being hated by Westie is like being mauled by a kitten. The only thing of value I got from this whole video is the acknowledgment from DICE that the game engine is past it's prime. It's no secret that you-tubers like Jackfrag and Westie etc have privileges that most gamers don't have or just dream of .. I wonder when was the last time they actually paid for a game? The perks of the privileged few including all expenses payed junkets around world would be a difficult thing to jeopardize, especially when it puts food on the table. Bottom line is..whatever their opinion maybe is only an opinion..it shouldn't be taken as gospel.. unfortunately some gaming developers may. 2. The game engine is the back end. Just because it's worked on previous versions of software doesn't mean it's magically going to 100% work on newer versions. Between BF3 and BFV, there's been 2 whole new versions of C++ (and C#). Things break and things aren't compatible anymore. Code breaks on a fundamental level. And that's just the source. Game engines update to work completely differently. One update might calculate gravity by object.pos.y - GRAVITY (gravity is all caps because it's a constant). The next major version can be object.pos.y - getGravity() which may return a forumla that's exactly GRAVITY constant. It happens. The difference between Java 7 (legacy finished around July 2015) and Java 11 (current version for Long Term Support). There's also been significant increases to C++ and it can be made worse if they were running the previous LTS version (C++ 98 vs C++ (20)11). Things break. Just because they work once in a game 10 years ago doesn't mean it's going to work now. 3. EA isn't the developer. They're the publisher and parent company of DICE, the creator. EA has the final say in what DICE creates. So DICE could want to make the best game they possibly could but EA pulls a "Microtransactions" and "Do this by <date> or you're not getting a bonus this year" for the DICE developers. DICE simply doesn't have enough time to do all of this work. They're already pushing sometimes up to 60 hours a week just developing. Least you could do is acknowledge it. Most of these points don't make much sense and it's clear that anyone that brings up any of them (especially point #2) that they've never developed anything software wise in their life, let alone over extended periods of time (5+ years). DICE has been working with BF for almost 20 years. Just because you were able to do something in BF 1942 doesn't mean you can be able to do that in BFV. 2 completely different games and 2 (effectively) completely different languages, engines, and hardware capabilities. It's nearly impossible to predict what can happen in the far future and to optimize for 10+ years from now is not in a company's best interest. So yes, the game is broken. No, you shouldn't stop complaining about it. But yes you should be complaining and actually using your brain when you do it vs just regurgitating what someone else said that still knows nothing about the back end, front end, or any other end of the development chain there can possibly be. So try and understand a little. Be constructive and patient. We all know that DICE and EA have heard our complaints and responses. We all know that EA knows what business practices and game mechanics work and what doesn't, especially after the backlash on some games like Battlefront 2. The whole point is that after voicing our concerns and changes aren't implemented, and all we get is a generalized statement and no feedback on anything in particular, then stop supporting them. I have made the decision that if DICE and EA fail to listen then I will simply not buy their next product. We act as if this game was force fed down our throats, I myself and millions of others made the decision to go buy the game, and we can also make the decision not to buy. Don't understand how this game has potential to last 6 years (point 3) if the game engine is not up for the job (point 2)? The engine is usually the foundation of a long lasting and successful game. I watched this vid when it first came out. The biggest thing that stood out to me is that I think JF has used some incorrect language to describe the game engine. 1. The architecture of BFV in the Frostbite engine including its dev and release processes being fundamentally poor making it nigh impossible to update some things. This is causing nightmares from the sounds of it. However I think its obvious when you make some logical assumptions in what we have seen. 2. The way the stats and data is managed. This seems to be working worse than it ever has in a Frostbite game causing us the awful assignment system as well as the massive lagginess in statistical tracking. Both the above would be an absolute nightmare to address and probably form 60% of dev time in the initial build. Side note. Dang the vitriol towards JF is a bit gross from a few ppl. Well you may want to rewatch it be because this engine is far from past its prime. I got more of they bit off more then they had high expections without realizing how difficult it was and gambled to go big or go home and now with being rushed and constant complaints and BF version of flat earthers they feel like they messed up. This is a whole new engine simply because they have rtx and actually they are the only dev team to get it working and if they didnt nvidia would have been with a bunch of cards and no way to even display the main feature of them. For people to think it is simple to port something I would gladly invite you to learn to code or at least get a understanding of what is involved. Not only do they have 3 different platforms that means they have to possibly use 3 different languages/ API, they also have all the servers to work with. Every one of these so called " Game Changers " is also responsible for pushing battlefield into the sorry state its is now. Which gets very " logical " when you think about it. I'm not going to beat around the bush when I say that the battlefield community is one of the most ignorant communities I've regrettably been a part of. I say this because because every time there's something wrong with the new battlefield game the first thing anybody on this forum does is deflect the blame on something else. There's a change to the game that you don't like? Goddamn call of duty players, ruining our precious battlefield experience. Dice is not pushing out content fast enough because of Tides of War? It must be the work of battlefield content creators, how dare they voice their opinion in videos that I watch daily. Over and over again this low effort drivel gets posted here, and everyone eats it up because they don't want to contend with the idea the only people at fault here is Dice and the community itself. "Game changers" are responsible for pushing battlefield 5 towards being a fast-paced shooter? Really? Bf5 has been the slowest battlefield game since bf2, and it's certainly has the most camper friendly meta in the franchise. You're telling me that a battlefield game filled with MMG campers and people lying prone like corpses to take advantage of the poor visibility is more fast paced than bf3 and bf4, 2 games that are objectively the most "cod-like" battlefield games. You're telling me that bf5's movement speed is too fast, when bf3 and 4 has even faster movement speed, and that bf5's weapons have no recoil when anybody who's actually played bf3 and 4 know that the guns in those games are practically lasers when compared to bf5's counterparts. There's zero connection between what you say and what's actually true here. Tell me, what specifically did these "game changers" say or do that is actually responsible for battlefield 5's "sorry state?" Did they ask for the game to be unfinished at launch, and have the rest of its features drip-fed as part of "Tides of War?" I don't recall ever hearing that from them. Did they ask for there to only be 2 factions at launch, with only obscure WWII battles covered and a good amount of iconic WWII weapons absent? No, that was the exact opposite of what every battlefield youtuber and streamer wanted. Did they ask for Dice to hastily release a half-baked ttk patch that didn't fix the problem? No. Did they say that bf5's beta was perfectly bug-free and tell Dice it was in an acceptable state to launch? No. What exactly did these "game changers" push for that actually influenced Dice's decision-making and ended up detracting from the game? I'm trying to figure it out here. The only thing that seems to fit your narrative here is that battlefield content creators did ask for Dice to move away from paid dlc in favor of free content updates. And Dice wasn't even influenced solely by the content creators, because the whole gaming industry in general has been moving towards that model in the first place. Games like titanfall 2, rainbow 6 siege, fortnite, apex legends, etc. are all receiving post-launch content for free. The fatal flaw with Tides of War, however, is that Dice couldn't even finish the base game at launch, so any hopes of getting meaningful post-launch content early on is a pipe dream. If anything, you should be angry at Dice and EA for being completely incompetent at delivering adequate post-launch content, instead of the content creators pushing for consumer friendly practices. It's ironic, because when bf3 was launching 8 years ago there was this massive outrage about having to pay for premium, and now everyone is begging for EA to bring back greedy business practices that they previously condemned. If you truly think that these "game changers" are anything more than a thinly veiled marketing tactic, then you are incredibly gullible. Many "game changers", including levelcap, xfactor, jackfrags, matimi0, and basically every other scapegoat you love to hate, have expressed on numerous occasions that any suggestions they make to Dice goes in one ear and out the other. They're as responsible for Dice's decision-making as you are responsible for making the sun rise every day. In reality, battlefield content creators don't have nearly the amount of influence as you'd like to believe they do, and they're certainly not responsible for all of bf5's flaws. So what are you getting angry at them for? For making videos that you choose to watch? For providing you with entertainment on your meaningless friday night when you have nothing else to do? For expressing their opinions on battlefield, most of which doesn't get recognized in the first place? The fact that so many people upvoted your comment is a sad reflection of how woefully ignorant the battlefield community is and how readily they are willing to deflect the blame for bf5's shortcomings on the content creators that keep the community alive in the first place. It's a little saddening and extremely pitiful to see how eager this community is to burn their content creators at the stake for supposedly "ruining" battlefield, when in reality all they do is make some damn battlefield videos for the entertainment of you entitled children. I would agree that the game is not in a great state as of right now. It's been out since November of 2018 I believe and we're now in March and we finally get a I don't know if I'd call it a DLC but we get new "content" which is Firestorm coming around the 2nd to last week of March I believe (Correct me if I'm wrong). Battle Royale in a battlefield game feels uncanny to me for some reason though I guess it's the setting of World War 2, if it was Modern Warfare then sure I'd be fine with that but the Battle Royale craze right now isn't for me. It feels as though BFV is following in the footsteps of Battlefield 1. BF1 releases in Oct of 2016 and we got They Shall Not Pass in March of 2017. I feel as though Battlefield V will follow the road-map of Battlefield 1 and then during the last leg of BFV we get a rushed DLC like Apocalypse that's just far below average with modes that none of us want, (looking at you Hamada). I do agree with Frag's third statement on asking the scenarios of having a battlefield game for 5 to 7 years with continuous additions to the game and keeping it afloat with weekly updates, challenges, improvements to the UI system, weapons, factions, customization and better communication on DICE'S part as well but then there's the backlash that they'd possibly receive from the community and they're either afraid to answer them or just ignore us. If they came out and told the truth I'm sure that a lot of us on the forums would be understanding, just tell the truth and you won't be getting all the negativity that you are getting DICE but I think they need to stop asking the content creators on what the community wants and instead look at the comments here on the forums and try their best to somehow rectify the problems that are currently in the game right now. Content creators are not the voices of the community and I feel like they only listen to them and it makes us feel left out as if they're not listening to our concerns on this game. I do hope that Battlefield V succeeds in the future but currently this game is on Critical life support and if DICE and EA decide to focus all their attention on Fire-storm and not the core community who love the classic game play of Battlefield who give constructive criticism to make the game better, then this game will not last much longer.